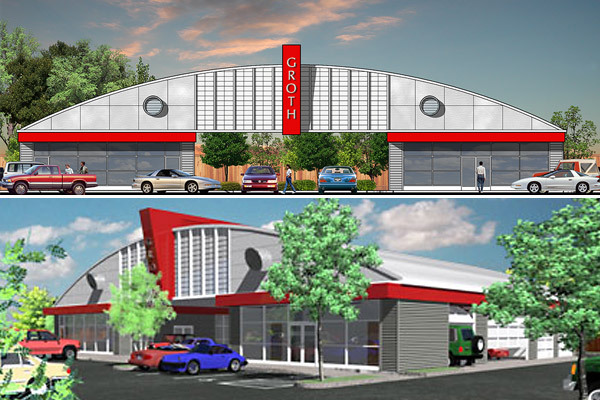 TFA designed this proposed building for an existing used car dealership on a busy commercial avenue. Looking to replace their current nondescript buildings, the dealership asked TFA to create office and vehicle repair facilities with a memorable visual impact. The resultant design consisted of two buildings to be constructed with economical steel frames and metal siding and bridged by a metal roof supported by curved steel trusses. TFA used ribbed and flat metal wall panels and metal grilles in combination with circular extruded vents and a tall angled vertical signage fin to mimic the flamboyant styling of 1950’s era American automobiles.